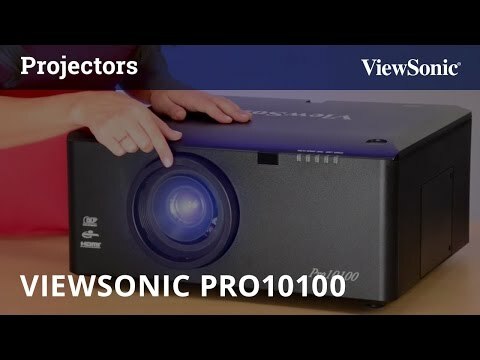 The ViewSonic Pro10100 is a high-brightness installation DLP projector for large venues. It boasts 6,000 lumens of brightness and is designed for theaters, museums, auditoriums, lecture halls, houses of worship and other large commercial venues. Standard Pro10100 product features include motorized zoom, motorized focus and lens-shift functions, PIP/POP functionality, network management capability, and DICOM SIM mode. A dual-layer dust-free filter and special heat-dissipation technology supports 24/7 continuous use. Optional features include interchangeable lenses that provide increased installation flexibility, image-correction technology for 4-corner, curve, pincushion and barrel and rotation projection surfaces, and multiple-image edge-blending capability. Plus, with its wide range of digital and analog inputs, the Pro10100 is the ideal solution for commercial installations and large venues. Designed to meet the needs of a large range of venues, the ViewSonic Pro10100 installation projector provides an ultra-high 6,000 lumens of brightness to easily accommodate theaters, museums, auditoriums, lecture halls, houses of worship and other large commercial venues. The Pro10100 ensures that your projected images will stay stunningly crystal-clear from greater distances without quality decay. Available with optional interchangeable lenses, ViewSonic’s high-brightness professional projector allows users to choose the most suitable lens for their large-venue applications. Multiple lens options are useful for a variety of venue sizes, screen sizes, and screen distances. Plus, this feature provides for more flexible installation, allowing existing projector mounts to be used to reduce installation costs. For large venue projection, the stacking feature allows users to project brighter images by gathering all of your Pro10100 projectors with accumulated lumens. The top stacking positioning holes enable an effortless and simple setup that only put one machine onto another without any accessory or knowledge. ViewSonic® SuperColor™ technology, equipped with an exclusive colour wheel design and dynamic lamp control capabilities, delivers the best in superior colour reproduction and detail, right to your very eyes. Embrace the difference, share life’s true colours, and leave a greater impact on your audience with an unforgettable experience with ViewSonic® SuperColor™ technology. Convenient and precise lens adjustment is guaranteed with this high-brightness professional projector’s remote-controlled power lens. By using the remote control, it’s easy to quickly focus on images, and zoom in and zoom out, with pinpoint accuracy. This feature means very clear imaging can be easily achieved in very large venues. Equipped with a power lens-shift adjustment feature, ViewSonic’s high-brightness professional projector adjusts images to match their original aspect ratio and centers them perfectly. It also allows vertical and horizontal adjustment to correct tilted or distorted images caused by uneven surfaces or mountings. Your images will be perfectly aligned within the desired viewing area every time. ViewSonic’s high-brightness professional projector uses the latest DICOM SIM technology to precisely display multiple high-resolution DICOM-format medical images, including X-rays, sonograms and nuclear magnetic resonance (NMR) images. Whether it is used in hospitals and medical centers, or for academic conferences, the projector always delivers the most precise DICOM images. With a 5-BNC connector design, ViewSonic’s high-brightness professional projector is capable of projecting pixel-perfect images to audiences in large venues such as auditoriums, shopping malls, museums and more. The 5-BNC connector is designed for analog and Serial Digital Interface video signals (R, G, B, vertical sync and horizontal sync signals), and effectively increases signal accuracy and image quality by decreasing signal latency during data transmission. Perfect for high-end applications and large screens, ViewSonic’s high-brightness professional projector boasts edge-blending and brightness-adjustment features. By matching colours and adjusting brightnesses, the edges of different images are seamlessly combined and can no longer be seen – no matter how large the projection screen surface. ViewSonic’s high-brightness professional projectors come equipped with a 5-mode warping and geometric adjustment feature. This feature corrects distorted images caused by 4-corner, curve, pincushion, barrel and rotation projection surfaces. Plus, bi-directional (vertical /horizontal) auto keystone correction allows the projector to project images perfectly, making it adaptable to any situation. ViewSonic’s high-brightness professional projector includes an integrated 12V trigger output feature that allows it to be connected via 12V cable to a motorized projection screen. Efficient and convenient, the projection screen lowers when the projector is turned on, and rises when the projector is powered off. Best of all, you won’t need a second remote control – it’s automatic! ViewSonic’s high-brightness professional projector features network connectivity and comes with Crestron RoomView® resource management software installed. This software lets users control their networked projectors from a computer via wired or wireless local area network, providing complete control over an organization’s combined audio-visual resources. With Picture in Picture (PIP) and Picture over Picture (POP) viewing modes you can share two videos or images from different sources. Multi-source projecting makes images and videos in presentations more impressive and effective. A dual-layer dust-free filter system effectively prevents dust from entering and affecting the system, and lowers the heat generated by the device. This advanced technology prolongs the projector’s durability and lifespan, ultimately cutting down on the cost of maintaining 24/7 operations. The Pro10100 is designed to accommodate a wide range of operating environments and installation applications. 360-degree installation means it can be installed both vertically and horizontally. Combined with powered lens-shift, edge-blending and PIP/POP features, this device decreases spatial limitations and provides improved projection flexibility for more stunning and creative audio-visual presentations. Equipped with setting memory function, ViewSonic’s high-brightness professional installation projector save your time perfectly. By using this function, it’s easy to quickly set your projector to fit your usage scenario like boardroom and classroom, especially when you play content with edge-blending function. Both for educational and commercial usage, this feature make easier setting possible. ViewSonic’s high-brightness professional installation projector boasts multi-level lamp voltage setting feature. Setting brightness correctly through level-up or level-down of lamp voltage, the overlapping image area become seamlessly when edge-blending function enabled – no matter how large the projection screen surface.